The form builder allows you to create and customize forms that can both organize data internally as well as capture data externally. The same form builder is utilized for internal forms as well as application forms and webforms. It is accessed through the Data tab on the navigation bar, by going to the Form Tools button in the top right and then Edit Form. Once in the Form Builder, you will see your existing fields, a panel to add new fields, and a tab to adjust the settings of your form. New fields can be added through the panel on the right-hand side called "Drag and Drop Fields." As the name implies, fields are adding through dragging the chosen field over to the form builder on the left and dropping it in the spot you would like this field to appear on the form. Text Allows for input of a short amount of text, typically one line, such as name, email address, or phone number. Text Box Allows for input of a longer amount of text, such as an address or a short essay. Dropdown Allows for a user to select from a pre-determined list of options presented as a dropdown. Settings can allow users to be able to select just one or multiple options. Checkbox Allows for a user to select from a pre-determined list of options presented as checkboxes. Users can select multiple options. Radio Button Allows for a user to select from a pre-determined list of options presented as radio buttons. Users can select only one option. Number This field type can be configured to allow for a number with a predetermined amount of decimal places (such as a GPA) and/or a currency. File Upload Allows for a user to upload documents and media. File types and sizes can be restricted. Date Appears as a calendar pickers such that a user can input a date, such as birth date. State A dropdown of all U.S. states as well as Canadian provinces. Country A dropdown of all of the countries. Year A dropdown of years. Linked Form Linked record fields allow a user to select a record from a different form. For example, a user may have input their biographic information on a different form and can link that information here. You can also display up to 10 fields from the linked record. Learn more about Linked Form Fields. Member Field Allows a user to select one or more users from the workspace. Heading Allows you to quickly create section headings. These are for display only and do not allow for user input. Presentational Text Allows you to present instructional or informational text to the user; does not allow for data input. Need to add special styling? Learn about Markdown Text. Calculated Field You can create a formula to calculate based on other values in the form - for example, total household income could be calculated based on input into other fields. A formula consists of form fields containing numeric data, separated by operators (+,-,*,/). Summary Field Allows you to summarize child data. For example: On the Companies form, summarize count of related contacts from the Contacts form. Hidden Field Hidden fields are a legacy feature and have been phased out. If you had hidden fields in a form prior, you wiil still have them. If not, they are no longer a feature in the system. They had generally been inserted for reporting purposes. For example, you may want to reuse the same form for a series of contests and change the value of the hidden field to indicate which contest the submission is for. Once a field is added to the form, you have the ability to adjust settings particular to each field. You can also drag and drop the field to change its placement on the form and delete the field by clicking the trashcan icon for that particular field. Additionally, you can edit field rules particular to that field. Clicking "Edit" will bring up the settings for that particular field, including naming the field, labeling how the field will appear to users, making the field required, setting up field validations, and setting a minimum and maximum amount of text, etc. Many of these settings are located under "advanced options." If you would like to copy an existing field and its settings versus creating one from scratch, you can use the Duplicate Field feature. You may wish to use this, for instance, if you are capturing demographic information about several individuals. Instead of creating a Name, Address, and Phone Number field multiple times, you could copy those fields. To copy a field, first make sure the field you'd like to copy is saved. You must save a form first in order to duplicate fields on it. Then, locate the Duplicate Field next to the conditional fields button on an existing field in the form builder. All you need to do is click this icon, and you will see the field immediately duplicated beneath the field in question. You can then make any changes to the field's settings from there. Note that there are several field types that cannot be duplicated: linked fields, summary fields, and calculated fields. Under advanced options, there are several Validation Options which you can set in order to pre-set what format of data is allowed, or will be validated, in that field. Note that not every field type has validation options; the screenshot and examples below apply to a text field. Maximum Length Sets the maximum allowed number of characters; characters include letters, numbers, punctuation/symbols, and spaces. Alphabetic Allows only alphabetic characters (letters); no numbers or symbols will be allowed. 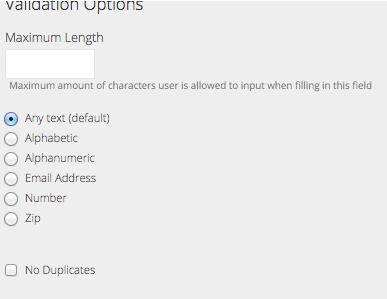 Alphanumeric Allows only alphanumeric characters (letter and numbers); no symbols will be allowed. Email Address Allows only input that is entered in email format, e.g. emailaddress@email.com. Number Allows only numeric characters, as well as decimal points; no letters or other symbols (including commas) will be allowed. Zip Allows only input that is entered in U.S. zip code format, e.g. 00000 or 00000-0000. No Duplicates Checking this off will allow only unique values. This is useful for IDs such as Social Security Numbers. Sometimes deleting certain fields can negatively affect data in your workspace. If this is a field you don't want users to remove, add a warning message that alerts them to the consequences if they're attempting to delete it. To do this, you can edit Field Purpose, found in the settings for each individual field in your form builder. In addition to individual field settings, you have the ability to adjust settings that apply to the form as a whole. These are located in a tab above the form builder. Name Name the form so it describes your data, like "Contacts," "Sales," or "Projects". Please keep it under 24 characters and plural. Submission Record Identifier Choose one or two fields you would like to use to identify a Submission Record throughout the app. If you choose two fields you can also choose a character to appear between them. Form Purpose Sometimes deleting certain forms can negatively affect data in your workspace. If this is a form you don't want users to remove, add a warning message that alerts them to the consequences when they attempt to delete it. Here you can set a Submission Folder, meaning that any submitted entries of this form will automatically move into that folder. You can also Manage Folders in order to add other folders to be used in other processes throughout your workspace. 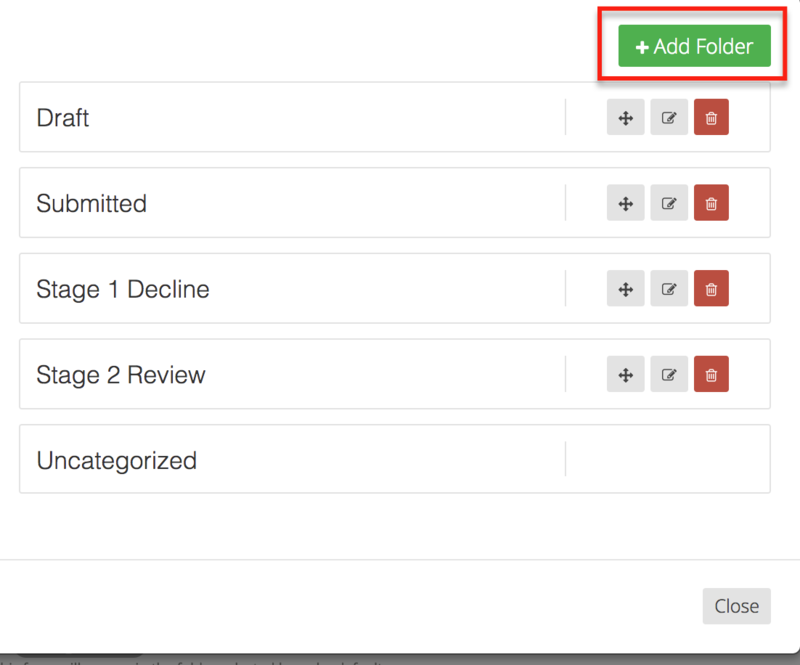 Click the gray Manage Folders button in order to access existing folders and create new ones. You can Add a New Folder or drag and drop, rename, or delete an existing folder. When you press Close, be sure to select from the dropdown the folder you'd like to designate as your Submissions folder. If you want to rearrange the order of forms in your workspace or delete a form, navigate to Workspace Settings in order to do so. In addition to the ability to rename or create a new form, you will see a drag and drop capability as well as a red delete option.